The Dhumal government has been clamouring for restoration of industrial package up to March, 2013, but with leader from the state Anand Sharma heading the Union Ministry for Commerce and Industries, something more could be in the offing. A comprehensive relief package for labour-intensive sectors like handicraft, textile and plantations, including debt-mitigation scheme for small coffee growers, were among the fresh stimulus being contemplated by the Centre to combat economic slowdown, Union Minister for Commerce and Industry Anand Sharma said here today. 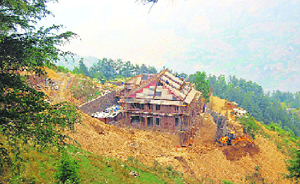 In the aftermath of issuing demolition order in 57 out of 288 cases in this town, director (urban development) has directed the executive officer (EO) of the Mandi Municipal Council (MMC) to call its “emergency meeting” immediately and submit “complete action report to this office within two days complying with the high court order on removal of all 288 cases. Union Steel Minister Virbhadra Singh today warned ‘steel mafias and black marketeers’ across the country that if they do no fall in line honouring government laid out prices and procedures their licences would be cancelled. Rousing welcome was accorded to Union Steel Minister Virbhadra Singh on his arrival in the district after assuming the role of Cabinet minister from Bajaura, the gateway of Kullu-Manali. Donating blood is like saving life of some person and there is no other donation which is equal to this greatest act of human kindness. The Himachal Pradesh police today sought help from 600 members of the Himachal Medical Representatives Union to curb the fast spreading drug-addiction menace, particularly among school and college-going students, to save the future generation from a disastrous situation. Chief Minister Prem Kumar Dhumal has urged Union Minister for Commerce and Industry Anand Sharma to get Rs 750-crore gravitational water supply scheme for Shimla town cleared from the Government of India. The Centre has drawn up a plan to cover illiterate women in the country aged over seven years under the literacy programme. A newly wedded couple ended up in the Indira Gandhi Medical College with serious burn injuries following a tiff at their residence in Tutu last night. Students who topped in various school board examinations were honoured with the JRPD Memorial Annual Awards at a public function to mark the foundation day of the local Indus Hospital. The Dalhousie police has apprehended four persons on the charges of shooting in the air when a cultural programme was going on at around 8.45 pm last evening. The local police today registered a case of stealing of a Maurti car (HP54-9200) from Jassur on Thursday night. Taking a serious note of the apathetic attitude of the road authorities with regard to the deteriorating condition of the 44-km Jarangla to Kharamukh portion of the Chamba-Bharmour highway, state Vidhan Sabha Speaker Tulsi Ram has asked the Chamba DC to hold a joint meeting of the authorities concerned, including the HP Public Works Department and the NHPC, to take stock of the situation and direct them to ameliorate the pitiable condition of roads. As the minister of state for external affairs there was not much he could do for the state. Still he opened a separate passport office at Shimla, the only thing within his hands to benefit the state. Now Anand Sharma has not only been elevated to the Cabinet rank but also holds the all-important portfolio of commerce and industries, having ample scope for helping the industrially backward state. Sharma is already on the job and he has decided to send a central team comprising senior officers to the state to discuss the problem of industrialisation with the chief secretary and other officers. The team will visit the state within two weeks and make specific recommendations to boost the economy and generate employment by promotion of environment- friendly industries. Anand Sharma said he had already reviewed the ongoing industrialisation in the region, including Punjab, Haryana and Himachal Pradesh, and he was convinced that special category states needed a special dispensation and there should be uniformity in concessions and incentives being allowed by the Centre to these states. The state produces a variety of perishable products like fruits and if these were processed, it would not only ensure higher returns to the growers but also contribute to food security. He also hinted at more incentives for growth of industries and boosting economy of hilly areas. Beisdes continuing incentives like duty drawbacks, interest subvention and direct subsidy to exporters under the DEPB scheme provided in the first stimulus package beyond December 2009, steps would also be taken to protect exporters from the volatility of dollar. All these proposals of his ministry for inclusion in the budget would be discussed during his meeting with Union Finance Minister Pranab Mukherjee in New Delhi tomorrow, Sharma informed mediapersons. The objective was to at least maintain the level of exports at the last year level of $160 billion which would be quite an achievement at the time of global economic meltdown which has severely impacted all big economies across the world. Since the demand was slackening in the US and Europe, he had directed the director general of export council to focus on expanding economic engagements and finding new markets in Latin America, Africa and other countries. The debt-relief package for coffee growers would take care of all those having less than 10 hectare of plantation. After the second instalment of stimulus measures, the positive impact on economy would be visible after September and the country would be well on its way to achieve the growth rate of 9 per cent in the next fiscal, he said. Simultaneously, steps were being taken to improve investment environment in the country to simplify procedures and have uniform rules in all states. The inter-state trade council, which had become defunct, was being revived for the purpose, he added. Referring to the WTO agenda, he said India was committed to take forward the Doha process for which discussion had to be resumed on the basis of draft reports on agriculture regarding non-agriculture market access (NAMA) to help put in place a fair trading regime. He said he was in touch with the European Union, the UK and other partners in the G20 for a collective effort to give momentum to the process. He would be going to the US shortly and hold discussions with Hillary Clinton, the US trade representative and the secretary concerned. This directive has sent panic waves among councillors and residents who have raised unauthorised houses in the town. It stated that the principal secretary, urban development, has to submit compliance affidavit in the HC on or before June 26. According to the directive, director (urban development) has directed the EO to hold the meeting immediately and submit action report on unauthorised constructions within two days. The EO has summoned the emergency meeting of the council for June 15 in which it will take up the rest of “231 cases of unauthorised construction”. Meanwhile, four councillors- Gagan Kashyap, Sushila Sonkhla, Yog Raj and Mahender Kumar, in a written complaint to the director, have demanded that all proceedings of the meeting of the council called on June 3 should be registered on the “proceeding book” so that “correct report was sent to the HC”. The director has stated in the order that EO had filed an affidavit in the HC in which he had admitted that there were 288 cases in the town, but it had issued demolition order on 57 cases only. The director had stated that the council must give details on the nature of deviation and action taken on each case. The whole exercise should be intimated to the office within two days from June 12 onwards, the directive said. Executive officer PL Thakur said the emergency meeting of the council has been fixed for tomorrow and all 16 councillors have been informed. He said the ministry was exploring to set up steel processing units in the state. But the state government has not yet provided land for the Kandrori steel-processing unit, he added. On a two-day tour of his parliamentary constituency, Virbhadra Singh said a team would survey the Nahan foundry and ensure that a suitable site was found for setting up a steel-processing unit in the area. The foundation stone for the one-lakh tonne capacity Kandrori steel unit in Kangra was laid in February last, but the state government has not provided land so far to start the work there, he said. Responding to queries at his first press conference here today, Virbhadra Singh said since raw material for the steel units if set up in Himachal involves more cost, there was only a possibility of setting up steel-processing units in the state. “SAIL depots exist in Himachal and if the need be we will set up more,” he added. He warned the steel “black marketeers and mafias” stating that the government had fixed prices to enforce transparency and if anybody found indulging in malpractices their licences would be cancelled. The government had decided not to increase steel prices in the country, as there is no need for that so far, he asserted. Virbhadra Singh said the ministry had chalked out a “revival and modernisation strategy” for private and government steel industries involving an investment of Rs 70,000 crore in 100 days. “We are seeking to achieve a production target of 124 million tonnes to meet every demand,” he added. Virbhadra Singh, while addressing a public meeting at Dhalpur today, said his mission remained “welfare of Himachal Pradesh” and would do all possible for the state. He thanked the people of the Mandi parliamentary constituency for electing him to the Lok Sabha and Prime Minister Manmohan Singh and UPA chairperson Sonia Gandhi for entrusting on him the responsibility of a Cabinet minister. He said he would try to strengthen the Congress party in the state and also fulfil the promises made in the Congress manifesto. He called upon the sate BJP government to join hands in the state’s development. This was stated by Additional District Magistrate Subhash Chaudhary while presiding over the World Blood Donation Day function at the Regional Hospital here today. He said total 16 persons donated blood. Several voluntary organisations like Nirankari Mission, District Nehru Yuva Kendra, Vyas Samiti and local college students have been doing immense service to the humanity by organising and inspiring youths to come forward to donate blood. Chaudhary also honoured the blood donors of the district. Competitions in spot painting, declamation and slogan writing were also organised on blood donation. In spot painting: Anupama Sharma was first, Nisha Rani second and Minakshi was third. In declamation: Reenu stood first, Dipika Thakur was second and Poonam Bhardwaj was third. In slogan writing: the first, second and third positions were bagged by Jasvir Kaur, Seema Kumari and Neha, respectively, while Manisha and Babita were given the consolation prizes. Kangra: More than 100 blood units were donated today by an equal number of medical representatives affiliated to the Himachal Medical Representatives Union (HMRU) and medical students of Dr RP Govt Medical College, Tanda, in connection with the Universal Blood Donors’ Day on Sunday at DRPGMC, Tanda. Pardeep Sharma and Sudhir Thakur, state president and general secretary of HMRU, respectively, said the organisation was always at the service of humanity through the noble cause of blood donation. Medical representatives of different pharmaceutical companies affiliated with the HMRU donated blood today, they added. Some employees of the medical college too donated blood on this occasion, disclosed Dr Anil Chouhan, principal of the college. Kangra SDPO Jeet Singh Thakur, while addressing a gathering, told the union members here today that drug addiction was spreading on an alarming rate. He said the police was doing its job but unless the society came forward, it was not possible to eradicate the menace. He suggested that medical representatives should launch a state-wide awareness programme to keep students away from drug addiction. HMRU state general secretary Sudhir Thakur offered the services of their volunteers for this purpose. HMRU expressed gratitude towards Minister for Health Dr Rajeev Bindal for accepting their demand of visiting hospitals between 2 pm and 4 pm. He raised the matter when Sharma called on him at his residence last evening. The ambitious project to bring water from Chanshal in Rohru, 180 km away, is proposed to be implemented with the assistance of the World Bank. He said the World Bank was satisfied with the proposal and had agreed to fund it. The proposal had been routed through the various ministries concerned and the final clearance was awaited. The scheme would also result in energy saving, amounting to about Rs 100 crore. Dhumal also raised various other issues with the Union Minister, including release of transport subsidy and capital subsidy, besides restoration of the special industrial package up to 2013. He said with the announcement of the package, a large number of entrepreneurs had come forward to set up their units in the state. He pointed out that as the package was to expire in March 2010, the pace of industrialisation had slowed down. He had raised the issue at all levels and also sought the intervention of the Prime Minister to get the package restored. The Chief Minister said 643 acres of land had been identified and approved by the the Central government near Dehra for setting up the proposed Central University. A detailed project report was required to develop the campus so that classes could be started early, he added. He said that there were functional infrastructural facilities available in Dehra where first batch could be started. He urged the Union minister to take up the matter at his level with the concerned ministry so that the first batch could be admitted from this academic session. He also sought his personal intervention to get educational institutes such as Indian Institute of Management (IIM) and Indian Institute of Information Technology (IIIT) sanctioned for the state. Stating this here today at the two-day workshop organised by the State Resource Centre, secretary of the National Literacy Mission Jagmohan Raju said a separate women literacy mission would be set up for the purpose. He said at present there were 34.26 crore illiterate women in the country. He said to implement the programme practical plan would have to be formulated taking ground realties of different states into consideration. Further, a continuous follow up programme was also required to ensure that those covered did not relapse into illiteracy. In Himachal Pradesh there were 3.41 lakh women among 4.7 lakh illiterates aged between 15 and 45 years. In certain areas of the state the female literacy rate was as low as 40 per cent. The lowest literacy rate of 32.1 per cent was in Churah in Chamba, followed by Multhan (39.4) in Kangra and Bhalia (41) in Chamba. Congress president Sonia Gandhi came on a flying visit to Mashobra, near here, today in connection with the house being constructed by the family. The private visit was kept a closely guarded secret and the police was only informed that Sonia Gandhi or Priyanka Vadra would visit the place. Since there was no programme for her stay overnight, no security arrangements were required to be made by the police. While police officers refused to confirm or deny whom among the two actually paid a visit, sources said that Sonia Gandhi came in a helicopter and landed at the helipad on the premises of presidential retreat, located nearby. She went to the site where construction work was on and after spending some time there returned to Delhi. According to the police, the husband Deepak lost his cool following an argument with his wife Alka. He doused her in kerosene and set her ablaze in a fit of rage. However, when he realised his mistake, he tried to put out the fire to save her and in the process himself sustained burn injuries. The husband has sustained 50 per cent burns while the wife almost 80 per cent. The condition of Alka was stated to be serious. Lokayukta Justice Bhawani Singh, who was the chief guest at the function, gave away the awards to nine students. The awards have been instituted by chairman of the Indus Medical Foundation Balak R. Verma in the memory of his parents. The awardees included Akhilesh Nadda (Silver Bells Senior Secondary School, Hamirpur), Swany Dang (Dayanand Public School, Shimla), Manohar Lal (Government Senior Secondary School, Hamirpur), Astha Kapil (Him Academy Public School, Hamirpur), Ishita Vashishtha (Loreto Convent, Tara Hall, Shimla), Ishu Singh (Dayanand Public School, Shimla), Pooja Devi (Government Senior Secondary School, Makreri (Mandi)), Monika Sharma (AVN Senior Secondary School, Nahan) and Nayan Tara (Auckland House, Shimla). Cultural programmes are being performed in Dalhousie hill town on every Saturday and Sunday to mark the ‘Dalhousie summer festival’ in collaboration with the tourism department and the local administration. According to police sources, soon after the cracking sound of two or three gunshots was heard, there was a great commotion in the crowd of tourists who had come from the plains to enjoy the concert here in the hill town. Bishan Singh, the complainant, alleged that two unidentified persons had hired his car for Basolli (Jammu and Kashmir) that evening. He parked the car outside his house and as he went inside, the accused decamped with the vehicle. A case under Section 379 of the IPC has been registered. The Speaker said there was a great resentment and outcry among people and transporters that the road had deteriorated to such an extent that it was taking about three hours to cover this distance, which could be covered within an hour. “Orchardists and farmers of the Bharmour and adjoining areas are incurring huge losses due to this rough patch of road. Also the graph of accidents is on the rise and for the past few months around 15 persons have been killed and 30 persons injured on this road,” the Speaker stated.